As aircraft OEMs search for new ways to simplify the supply chain, they depend on high-performing, vertically integrated suppliers. The Alcoa Titanium & Engineered Products (ATEP) division facility in Laval, Quebec, Canada, works to continuously improve and leverage its materials expertise and advanced manufacturing capabilities in order to meet the aerospace market’s ever-increasing customer demands for service, quality, delivery and cost. Alcoa is a global leader in lightweight metals technology, engineering and manufacturing. The company acquired the Laval manufacturing plant in 2015 as a part of its purchase of RTI International Metals. ATEP Laval specializes in the production of complex titanium aircraft components, such as seat tracks, body chords, spars, doorframes and wing attachment components for Boeing, Airbus and Bombardier, along with Tier 1 aerospace suppliers. Titanium’s unique properties make the hard metal challenging to machine cost-effectively. Nevertheless, ATEP Laval identified titanium-engineered products as a significant growth market. The problem was that general-purpose machine platforms were unable to provide the rigidity, flexibility or control necessary to fully optimize ATEP Laval’s processes, so it sought new titanium machining technologies. Due to the company’s previous experience with several Makino MAG-Series machines for large aluminum aircraft structural components, it decided to explore Makino further when looking for a titanium machining solution. The company invested in a Makino T4 5-axis horizontal machining center, which is purpose-built for titanium machining. Engineers from ATEP Laval closely evaluated full life-cycle costs amortized over the duration of an OEM contract. Through test-cut results, it determined that the T4 was the best investment to offset costs while maintaining requirements for quality and delivery. ATEP Laval and Makino engineers worked side by side to optimize processing methods that are nearly three times faster than the company’s previous methods. This collaboration with Makino’s titanium research and development team gave ATEP Laval confidence in the abilities of the equipment to deliver on the promise of performance that was made to customers. The T4 machines have enabled Alcoa’s ATEP Laval facility to reduce cycle times by more than 60 percent while simultaneously reducing tool costs by 30 percent or more. With the capabilities to deliver a complete titanium solution from raw material to finished part, Alcoa is well positioned to add value to the supply chain. Customers bring the company parts from other suppliers who have struggled to meet quality requirements. With the combination of a solid team and investment in the right equipment, Alcoa is able to deliver a quality product to its customers. Additionally, as one of Alcoa’s largest and most extensive machining operations, ATEP Laval shares knowledge and efficiencies with other Alcoa facilities, further enhancing the company’s overall capabilities. 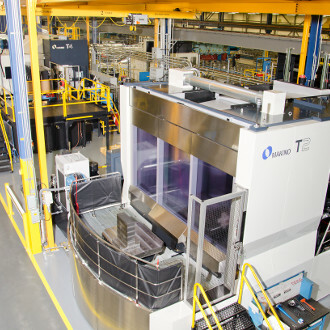 Since its initial T4 acquisition, ATEP Laval expanded its titanium machining investments with a second T4 and a smaller T2 5-axis horizontal machining center. It is also investing in Makino’s first-ever T5 machine to support production of larger titanium doorframe components.